ANTRIM senior hurling manager Terence ‘Sambo’ McNaughton says the changes introduced to the All-Ireland Senior Football Championship at Congress last weekend will be ‘another nail in the coffin’ for Ulster hurling. At Croke Park on Saturday, delegates packed the proposals to bring in the so-called ‘Super Eight’ from next year on a three-year trail basis. The format will see the last eight teams in the Championship split into two groups with the quarter-finals played on a round-robin basis to determine the semi-finalists. With more high-profile football games squeezed into the summer months, coupled with the fact that the All-Ireland finals will be moved to August, ‘Sambo’ fears hurling will get less exposure. “Can you imagine if there are three or four Ulster teams in that last eight? Hurling won’t get a look in,” said McNaughton. “All our hurling will be over by mid-June. That leaves the rest of the summer with no Ulster hurling at all. McNaughton did back the change which will give the winners of the Christy Ring Cup the chance to play in that year’s Leinster Championship – a change that will come into effect this summer. This Sunday, Antrim resume their National Hurling League campaign with a home tie against Kildare at Cushendall. The sides met twice last year, with Antrim winning on both occasions in the league and the Christy Ring Cup. However, the Saffrons didn’t have things all their own way, recording a 3-25 to 3-13 win in the league before emerging 3-20 to 0-17 winners in the Championship. Kildare have also strengthened over the winter months with former Kilkenny star John Mulhall now playing for the Lilywhites. Indeed, Mulhall plundered 1-1 for Joe Quaid’s side as they claimed a surprise 1-16 to 0-14 win over Westmeath last time out. Antrim are unbeaten after two rounds, but were held to a draw by Carlow at Netwatch Cullen Park in their last outing. The 0-21 to 2-15 draw followed on from their opening win over London in Corrigan Park, but McNaughton insists he was happy with the result in Carlow. 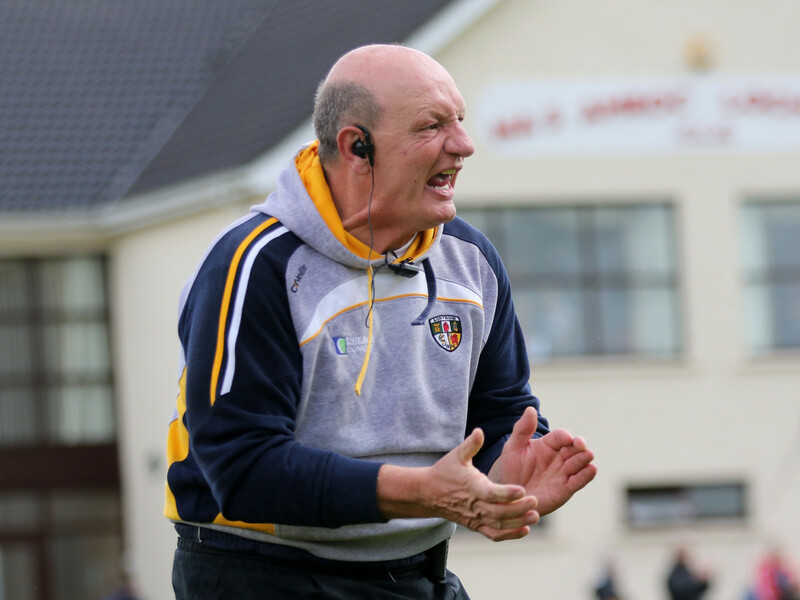 “It would have to be a point gained,” said the Antrim boss. “Carlow are not a bad team – they have a good set-up. Over the last few years they have put in a lot of hard work. We have to be realistic about where Antrim hurling is at. ‘Sambo’ added that the management team have yet to speak to Arron Graffin about the possibility of returning to the county panel. The Cushendall defender travelled to Asia and Australia following his side’s All-Ireland Club campaign last year but has recently returned to Ireland. McNaughton stated that Graffin would be ‘more than welcome’ if he wants to return to the Antrim set-up. For this weekend’s clash with the Lilywhites, the Saffrons are sweating on the fitness of attackers Niall McKenna (dead leg) and Conor Johnston (hamstring) while Neil McManus remains sidelined as he recovers from a fractured cheekbone.